An honest angler will admit that luck is a factor in landing a truly big fish. But when more $1 million in total prize money is on the line you’d better have skill as well. 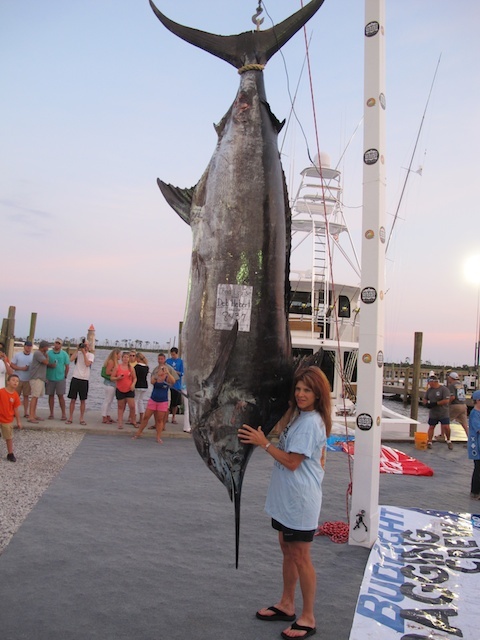 Both came into play today as 106-pound Deb Hebert whipped a marlin that outweighed her by more than 737 pounds. 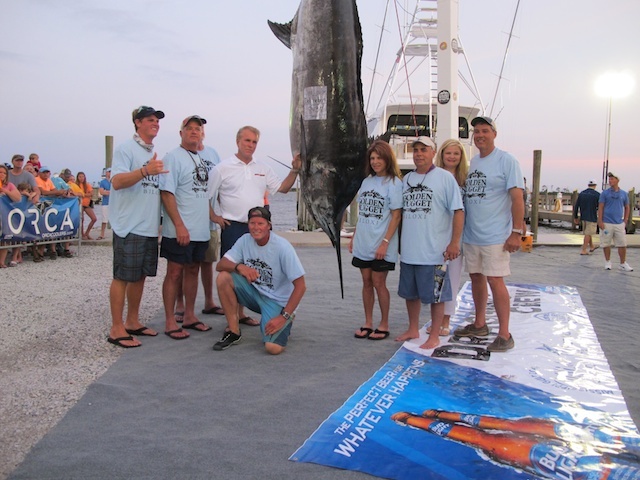 Hebert’s fish, an 843.7-pound blue, was the first and only marlin weighed Friday at the 2014 Mississippi Gulf Coast Billfish Classic. Hebert, who only recently started big-game fishing, caught her prize aboard Iona Louise, a 68 Hatteras that’s owned by her fiancé, Joe Hudson. This was the first marlin the petite lady angler has ever boated and the battle lasted a little more than three hours. Hebert, who is an Air Force flight surgeon and a marathon runner, has caught giant yellowfin tuna and released smaller marlin before now. But this is her largest catch yet and it’s the largest marlin ever weighed by a lady angler in the tournament’s 16-year history. Iona Louise was fishing about 30 miles south of South Pass, Louisiana, in 2,250 feet of water near the Ewing Bank, when the marlin ate a live five-pound blackfin tuna off the starboard outrigger. The fish was caught on IGFA 80-pound line with a 300-pound leader. The crew had to wire the fish 15 times before they finally boated it. Iona Louise took on fuel and ice before heading back out on a course for the same area. Fishing continues through Saturday and all the boats must be back to the docks by 8 p.m. One other marlin has been reported boated aboard Reel Fuelish, but the crew elected to stay out and keep fishing. There’s a saying that it’s better to be lucky than good. Today, Deb Hebert and the crew of the Iona Louise were lucky and good. And that just might prove to be the winning combination.